Today, most households have opted to have their own water purifying systems. This is largely due to the inadequacy of local utilities to provide safe, potable water for general home use. One of the more popular water purifying systems today is the reverse osmosis process. The following are some user tips for reverse osmosis subscribers. Before deciding any water treatment system for home use, get a thorough chemical analysis of the available water in your area. You can get a copy of test results that are regularly required from your municipality or the handling water company. If it is from a private well, have the water tested and certified. No single water treatment system is designed for all water problems. In case the water supply has high dissolved minerals, a reverse osmosis system is a good choice. The total R/O system usually takes around one-half of the space underneath the sink. The biggest component is the pressure tank that holds the treated water. This tank should be in upright position to prevent leakage, and placed in a heated area to prevent freezing in winter. The reverse osmosis unit itself should also be kept from freezing, and must be placed accordingly that there is elbow room for changing filter cartridges. Note that the R/O system is designed only for cold water. R/O systems can produce around a gallon of water every two to four hours. It is not advisable for activities like washing or showering. R/O systems for the entire household would be extremely expensive. The chemical that causes it is in the incoming water, most noticeable in hot water because the chemical becomes gas at higher temperatures. The “rotten egg” smell is caused by hydrogen sulfide present in the feed water (source) and carried to your house. Odors like petroleum or rotten eggs can be removed by using activated carbon filters, available in cartridge filtration systems or stand-alone units. The water pressure that drives the water through the membrane in the R/O system needs to be monitored from time to time. There is a limit how much pressure the membrane can tolerate before cracking. It varies between units and specified in instruction guides. It is always a good policy to compare prices before buying anything including water purifying systems. Compare the overall costs (installation and the regular maintenance costs) of the reverse osmosis system with the estimated total costs of buying your entire drinking water in bottles. Sometimes, the convenience of having reverse osmosis system in your home can cost you more than buying regular bottled water. Be sure to compare prices and the respective brands. The site of the National Sanitation Foundation (www.nsf.com) can provide much useful information to help you compare and decide. The reverse osmosis system cannot solve all your water problems. First, sand and silt quickly destroys the membrane. It is not ideal for removing bacteria, petroleum or slime. Slime materials coat the membrane making it ineffective. This means the R/O system is not effective for water that is contaminated with natural gas and chloroform. A high level of chlorine is also bad for the system. 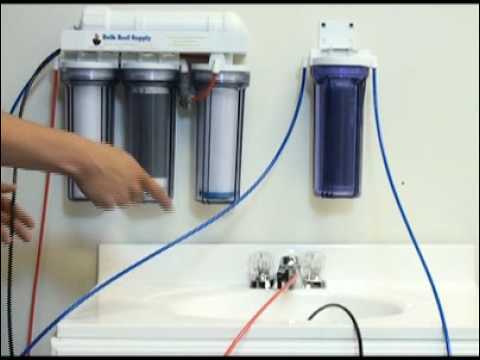 These are some of the reverse osmosis user tips that can help you install your R/O system at home. Or, it could alert you on some things if you have not chosen yet any water purifying system for your home.